Soft-serve... we just cant be together... right now. This blog will continue to be a living contradiction of sorts, at one post talking about fitness, at the next indulging in some halo-halo or ice-cream. So I understand that there is a divine reason behind the absence of Mini Stops in Cebu. There exists a cult following for their basic soft serve ice-cream, at least, that’s what friends in Manila tell me. I’m slowly being dragged into the soft-serve-side and my visits to Manila this 2012 have landed me in a Mini Stop at one point or another—only for the ice-cream, and the rudimentary cup of coffee. A Mini Stop in Cebu would be a hazard to my health—and those within my sphere of influence. It was not a Mini Stop… but it made my heart stop, my car, too and the planned jog for that night. Anyway, this will probably be my last ice-cream for the month. I’m not saying that this cone is the gastronomical equivalent of the Pink Floyd prism effect, when it comes to ice cream I only have two rules: This is ice-cream and That is not. Click on the image for further instructions. Should you want to make your own soft-serve ice-cream at home, you have to gather the following items with RPG music blasting in your headset. If you’re as inept as I am in the kitchen; however, you can just drop by the said yoghurt shop. I’ll leave you with a map, but you’ll have to figure it out by yourself—in true, retro RPG style. The item *World Map* has been added to your inventory! 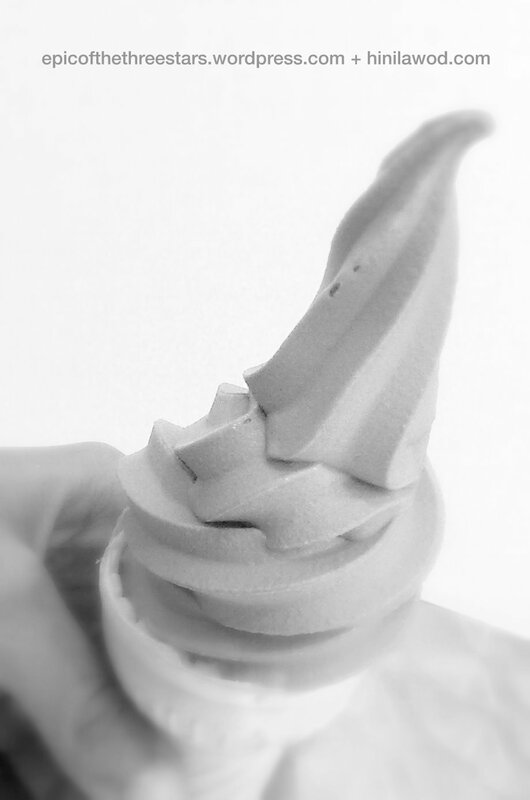 Soft-serve… we just cant be together… right now. Finding Suman: My very willing companion. Previous Post Gold in the mouth. Next Post Leonidas as a 50 year old. Yum! What’s an ice cream freezer? Ah, I like the latter link. I don’t think I have the money to spend for a real ice cream maker. Perhaps you’re interested on making an ice cream using just one ingredient: banana.